I’ve been thinking a quite a bit lately about honor, brotherhood, and duty. Right around the time I came up with the idea for Nerd Fitness, 300 had just hit the big screen and I was captivated by the cohesive heartbeat of the Spartan Army. I felt the same way as I watched Spartacus lead his rebel army in the epic Starz series that left me teary-eyed by the end. As this Nerd Fitness evolved from part-time blog to full time community, I was devouring page after page of George R. R. Martin’s A Song of Ice and Fire Series, recently brought to life in the TV series. In each of these cases, “the cause” becomes something greater than the person fighting. They become greater than the sum of their parts. As funny as it sounds, these awesome and epic stories seriously relate to the goofy, rambunctious underdogs here in the growing Nerd Fitness Rebellion. 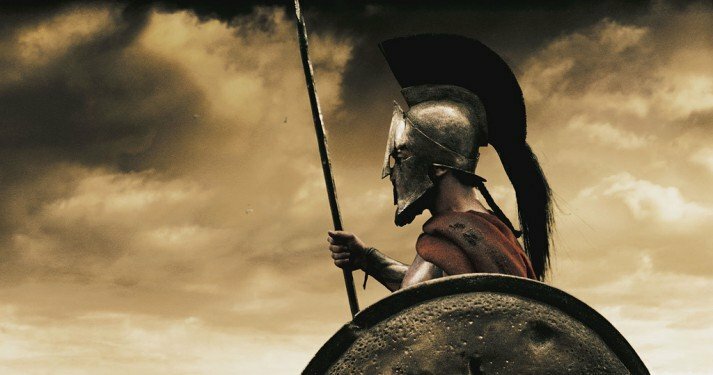 How did mighty King Leonidas and the 300 Spartan soldiers hold the army of Xerxes at bay for so long? By having a unified voice (HOO! HOO! 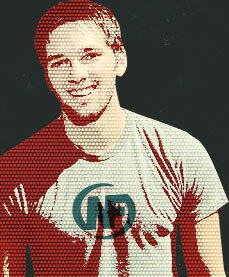 ), a unified cause, and a unified soul with which to fight! 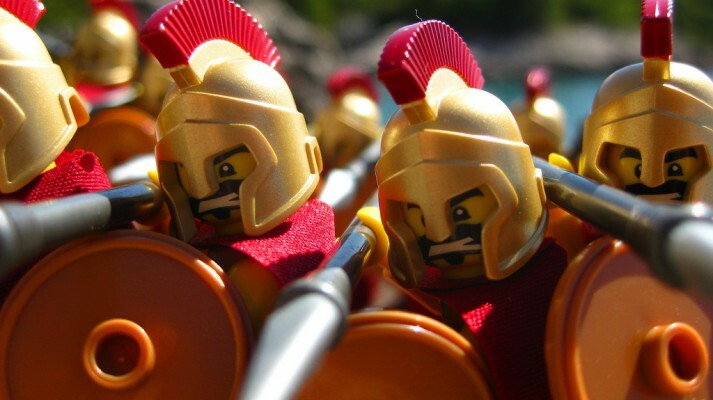 Many Spartans would often fight with the shields and spears of their ancestors; dropping those weapons on the field of battle to run away was considered far worse than death. We rely on each other for support in our quest for a leveled-up life. We have friends that keep us accountable when giving up seems easier. We have brothers and sisters that we teach all that we’ve learned, while looking for guidance from others that have already walked the path. It’s that support that makes us greater than the sum of our parts. Spend five minutes in the Woot Room and you’ll want to scream “FOR THE REBELLION” too. It might even make you want to don a loin cloth and start yelling, if that’s your thing. 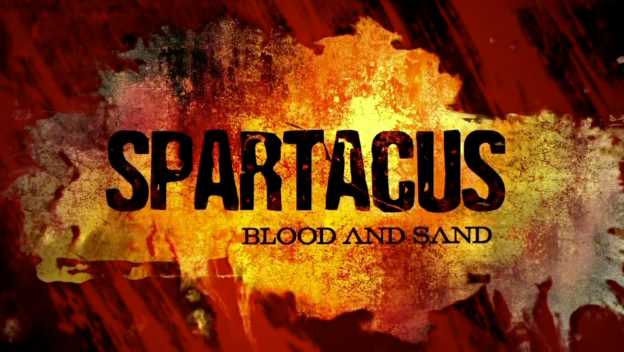 Despite its violent/sexual content (which may or may not be a plus depending on your tastes), the Spartacus series on Starz absolutely blew me away and brought me to tears by the end of the last episode. How did a small band of slaves make the mighty empire of Rome shake? They wanted it more. They stood united in belief. They fought for something greater than themselves. As Simon Sinek points this out in his incredible TED talk and book: “Start with Why,” companies, tribes, or rebellions become more powerful if they have a truly powerful “Why” that powers their every decision. Sure, the Nerd Fitness Rebellion helps people lose weight and make better eating decisions. That’s WHAT we do. We do it through a supportive community and corny, funny, educational articles. That’s HOW we do it. But that’s not why we’ve become such a force full of momentum. We want to be role models for our children and inspirational heroes for our friends and family. We want to look in the mirror with pride, and finally feel confident and comfortable in our own skin. We want to inspire people to stop using games and movies as escapes, and instead use them as inspiration to live adventurously in our own lives. We want to be part of something bigger than ourselves, and we want to bring our brothers and sisters along for the ride. We want to wake up in the morning excited instead of depressed, and go to bed proud rather than defeated. We want to feel alive, happy, and healthy. I want to talk about an episode in the last season of Game of Thrones on HBO. If you’ve seen it, I’m sure you already know which scene I’m talking about: the one in which Grenn, a brother of the Night’s Watch (a group of men sworn to defend the north by protecting a GIGANTIC wall), has to convince his fellow brothers to protect the inner gate from an impending attack. It’s one of the most amazing (and chilling) scenes I’ve ever seen, and it made me think a lot about the our ragtag group of brothers and sisters here. “I have been extremely tired since last fall, and fighting fatigue. I guess it’s ok since I am able to still do stuff, but really the only reason I get stuff done is that I make goals and wanna meet them. Because failing myself is failing the nerds, or something, and I like when the nerds cheer for me so I want them to cheer. I honestly started tearing up. I’ve been following this person’s story for over a year and I know what she’s gone through. On her down days, when she wants to curl up in a ball and give up (AKA stop “defending the gate”), she thinks about all the NF rebels that cheer her on, and she feels a sense of duty to follow through with her goals. It’s men and women like this that make Nerd Fitness what it is, and make our community what it is. We all have friends that flake out on obligations. They sign up for something and don’t show up, or they tell you they’ll show up and they never do. If we commit to something, no matter how big or small, we follow through with our promises. We hold each other together. If we say we are going to exercise with a buddy, we show up. Every time. If we say yes to a friend who wants us to go run with them, we get our asses to that track at 6 AM as agreed upon. No matter how tired we are. If we make a pact with a friend to eat healthy, we follow through, even when everybody else gives up. 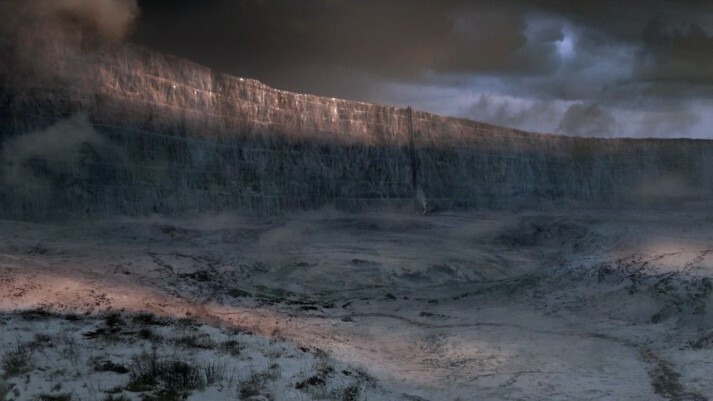 If our “shield drops” or if we “abandon our post,” the wall might fall. We must protect the wall. Especially on days when it’s cold. Especially on days when an army of 100,000 shows up to tear it down. Being a small part of this Rebellion has gotten me to the gym when I’ve been tired or lazy more times than I can count. I feel like I have a responsibility to all Rebels, and I hope you feel like you’re an important part of the Rebellion too, and thus must follow through as well. As with the Spartans, the slaves of Rome, and members of the Night’s Watch, we are part of something bigger than ourselves. We are an army of Rebels. Nerdy, goofy Rebels…sure. But dammit, we’re part of something pretty awesome! We have our rules that we live by. We are brothers and sisters sworn to support and protect each other. Sometimes, we have to do things that we don’t want to do, be it exercise, healthy eating, showing up to an obligation. But we have a sense of honor and duty to those around us. Those that look to us for inspiration. Those that would easily fade and give up if it weren’t for us always pushing to better ourselves and encourage them to do the same. By changing your life you are inspiring others to do the same, whether you realize it or not. I am a Nerd Fitness Rebel, and today is the first day of the rest of my life. I shall make no excuses and hold no grudges. I shall not brag about successes nor complain about my struggles, but share my experiences and help my fellow Rebels. I know I impact those around me with my actions, and so I must move forward, every day. I acknowledge fear, doubt, and despair, but I do not let them defeat me. I pledge my life and honor for the Rebellion, for this day and all the days to come. We stand as one! I’m glad to fight alongside you, and I hope you are proud to stand beside your brothers and sisters too. On days when you want to give up, remember that you’re not alone. On nights when you want to skip out, remember you have an oath to honor. When you want to bail on an obligation, remember your duty. There are 200,000+ Rebels counting on you. 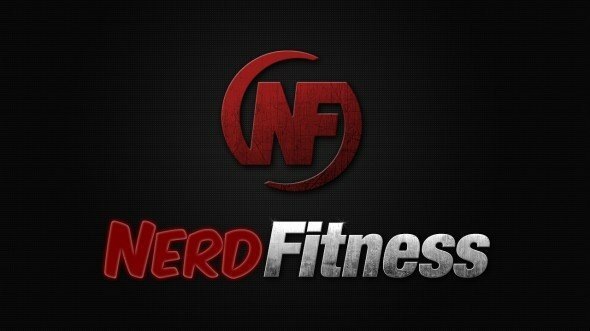 Welcome to the Nerd Fitness Rebellion: you’re in for life!